James Niven was born in Scotland in 1887, a son of William and Margaret Niven. When he was three, James’ family moved to Australia and settled in Warrnambool. The family lived in Henna Street and later Timor Street and James attended the Warrnambool Catholic School. He later worked as a labourer and fisherman on the Warrnambool wharfs. At the age of twenty-seven, James enlisted on 13 May 1915. On his attestation papers, James gave his place of birth as “coming out on the water from Ireland”. He left Australia with the 3rd Reinforcements of the 23rd Battalion on 26 August 1915. 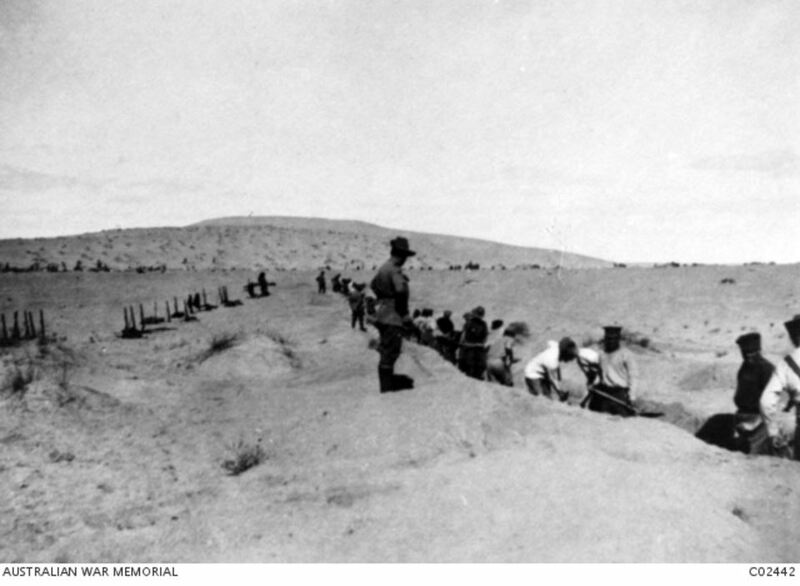 The reinforcements joined the 23rd Battalion at Lone Pine, Gallipoli on 11 October 1915. After the evacuation from Gallipoli, the battalion returned to Egypt. They were near Ismailia in the Suez Canal Zone, Egypt when James was admitted to hospital on 21 February 1916 with influenza. He rejoined the battalion on 9 March at Moascar. The 23rd Battalion was soon off to France arriving on 26 March. The following day they boarded a train for Wittes. It was while at Wittes on 5 April, James was AWOL not returning for twenty-two hours. He was given twenty-four days Field Punishment No. 2* and lost three days pay. In the days after they left Witte for Sailly to go on to Fleurbaix and into the trenches. From the beginning of May, the battalion was at Fort Rompu. While there on 20 May, James had his pay reduced by 1/9d for a replacement mess tin. 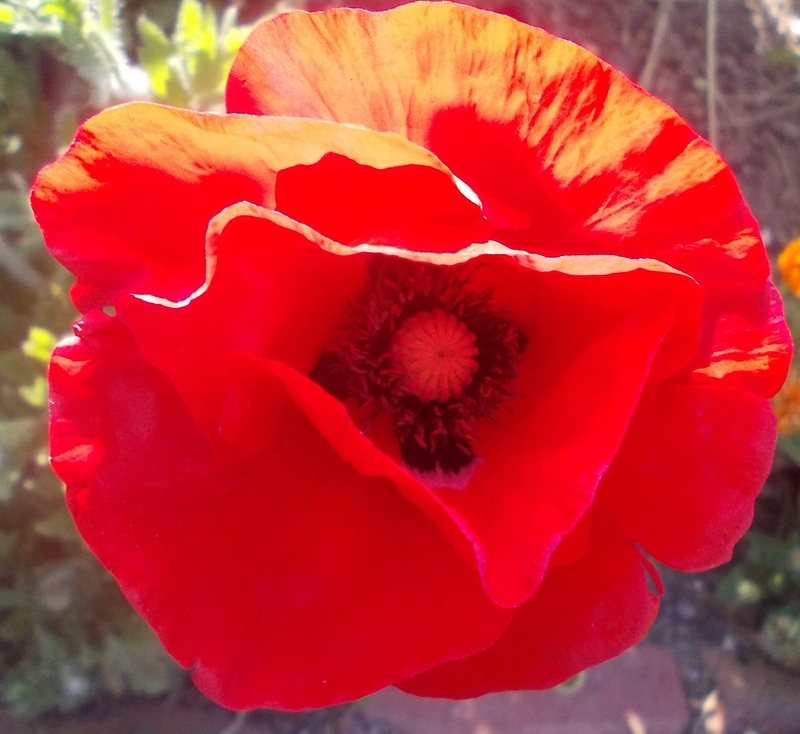 During July they were at Pozieres and remained there until 27 August. The battalions time at Pozieres was devastating with almost all the original members of the battalion killed. They moved out to Albert on their way to Ypres. It was the last leg of the journey on 4 September 1916 at Gezaincourt, James failed to board the train to Ypres when ordered. He was given Field Punishment No. 2 for twenty days. On 19 November 1916, the 23rd Battalion were in the front line trenches at Factory Corner near Flers, France when James fell ill with bronchitis. He was sent to hospital at Havre and discharged on 26 November. He then marched into the 2nd Australian Division Base at Estaples the following day. He was still there on 11 December when he was caught in Estaples without a pass. He once again received Field Punishment No. 1 for seven days. That was completed before he was able to return to his battalion. That was on 8 January 1917 with the 23rd Battalion in the frontline at Needle Trench near Lesboeufs, France. Two days later, James was back in hospital and didn’t rejoin the battalion again until 18 January 1917 when they had moved into camp at Ribemont. 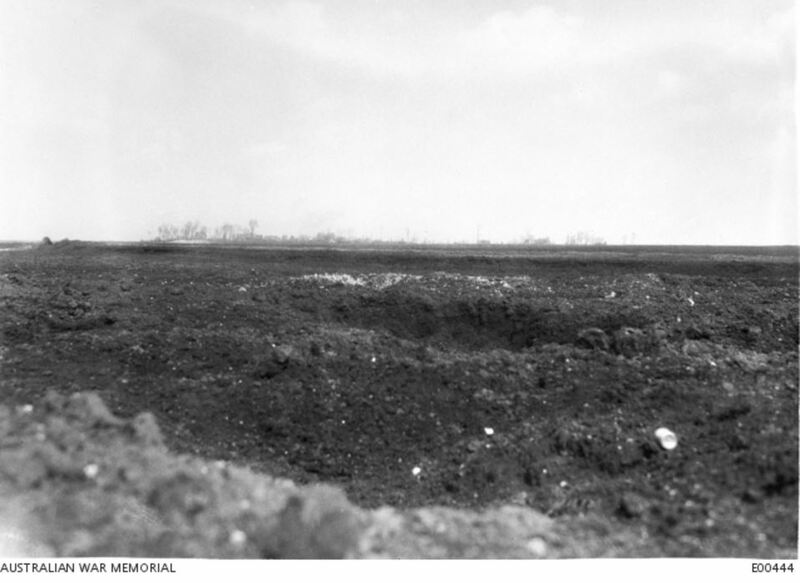 The next major battle for the 23rd Battalion was the 2nd Battle of Bullecourt from 3 May 1917. On 3 May, the battalion was part of an attack on Riencourt, just north of Bullecourt. They formed up at 3:30 am and moved forward fifteen minutes later. James was with the 10th Platoon of C Company. Heavy casualties came between 7:45 am and 11:00 am but the barrage kept up until 3:00 am the following morning. Seventy-nine men were reported missing and one of those was James Niven. Witnesses said they saw him severely wounded by a shell in a trench. His body was never found. 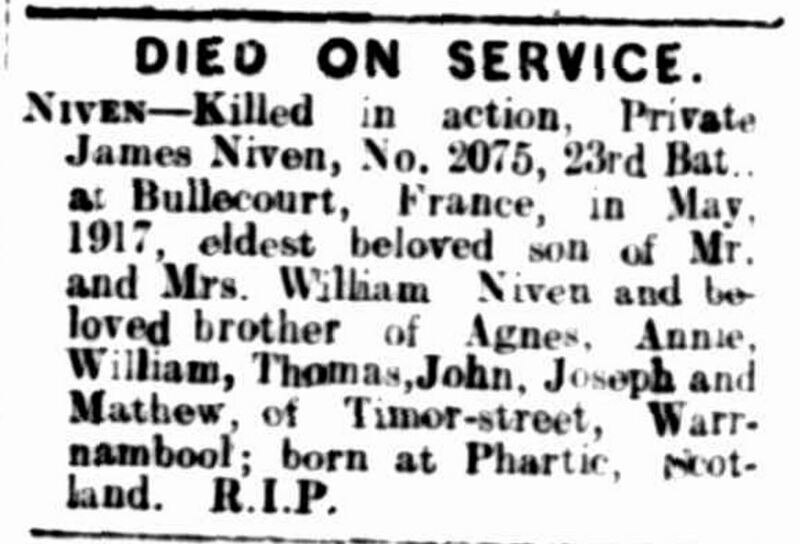 In June, the Nivens were notified James was missing but it was mid-December before the Niven’s knew of his fate. “Advertising” Warrnambool Standard (Vic. : 1914 – 1918) 15 December 1917: 2 (DAILY.). Web. 25 Apr 2017 <http://nla.gov.au/nla.news-article73973656&gt;. A tree was planted for James along the Clarke Street Avenue of Honour, Hamilton and his name is on the Hamilton War Memorial and the Warrnambool War Memorial. *Field Punishment – There were two types of Field Punishment (F.P. ), Number 1 and Number 2. Field Punish Number 1 (F.P No.1) consisted of the offender remaining in irons for the duration of his punishment. For no more than two hours each day, the offender was attached to a fixed object, in view of his unit, as a means of humiliation. Hard labour was also during the period. Field Punishment Number 2 (F.P. No.2) involved the offender being in irons for the duration, however, they were not attached to a fixed object.